Raising awareness is all well and good — but how about initiating the solutions instead and actually providing the necessary aid? This is global capitalism marketing an ongoing crisis while the powers that be fail in every respect to ensure even the most basic human rights in a first world country! Curiosity sparks further outraged questioning: how much money is being wasted towards a fake representation of what is currently happening? 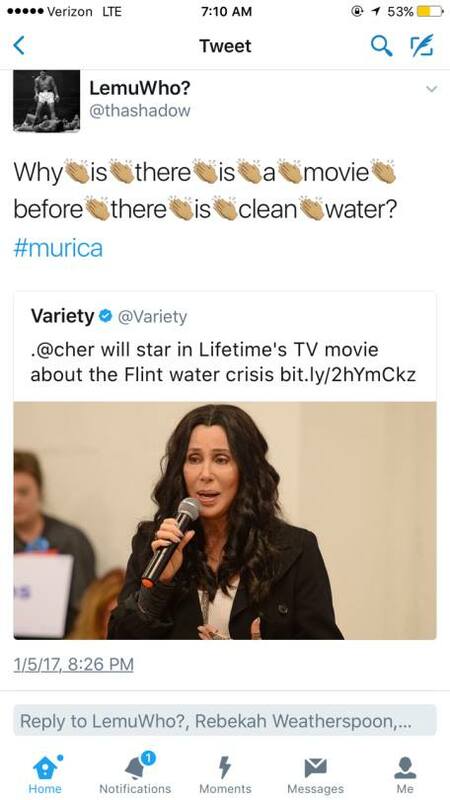 Seeing as it is currently happening, why not an honest documentary of the people’s real life experiences instead of another whitewashed (Cher will lead the cast; Flint, MI is a majority black state, so yes, whitewashed!) spiel? And the profits? Will they be dedicated to some actual aid?